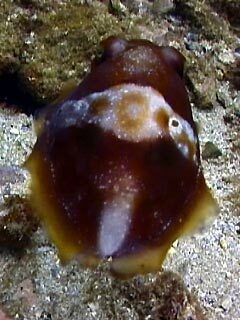 Like squids, but unlike the octopus, the cuttlefish has ten arms. Two of those are rolled up into pouches located in the cheeks and are adapted for capturing their prey. After finding a prey, the two feeding tentacles shoot out to capture it. 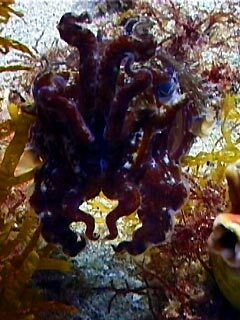 Holding on with the other eight arms and their beak the cuttlefish’s radula (tongue with many little teeth) is used to get to the digestible parts of the prey animal. Their diet mainly consists of shrimp, crab and fish. By moving their back fins in a wave-like motion the cuttlefish is able to move slowly back or forwards. The internalised shell, the cuttlebone, controls their buoyancy. By filling this porous ” backbone” with gas or releasing gas, the cuttlefish can regulate its buoyancy. After the animal dies the surfboard ?shaped cuttlebone is washed ashore. 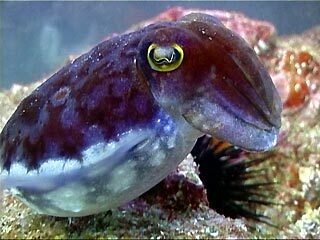 The eyes of a cuttlefish are highly developed and work similarly to that of humans. Cuttlefish are able to distinguish between different shapes of an object. They can’t, however, see colour. To escape the attention of predators, cuttlefish will first try to blend in with their environment. Tiny organs in their skin called chromatophores and the underlying reflecting cells enable the animal to change colour rapidly or use the ambient light by reflecting it to blend in with its environment. It is also able to change the structure of its skin taking on the appearance of sessile growth. This behaviour is called crypsis. Different combinations of rapid colours changes, change of skin structure and positioning of arms are also used as a form of communication between cuttlefish themselves to either protect its territory or to impress a potential partner. Figure 1 shows a good example of a cuttlefish displaying. Once detected, the cuttlefish can escape from predators by rapidly burrowing into the sand, using the water-jet from the mantle funnel, or emitting a distracting puff of ink to cover a retreat. 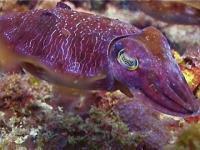 The ink not only can confuse the predator by creating a phantom prey, but it also contains chemicals which might block or desensitise the senses the predator uses detect the cuttlefish. Although the cuttlefish are solitary, during mating season you will see many couples. The male produces sperm packages, called spermatophores, which are transferred to the female’s oviduct back in the mantle cavity during and intense embrace whereby the couple swims head-to-head through the water. 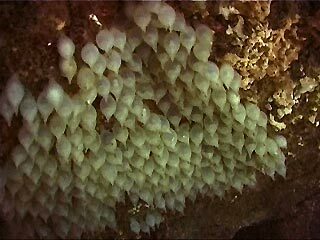 After fertilisation, the female lays round, white, yolky eggs on a sponge, gorgonian or any vacant position that is well washed by the current to ensure an adequate supply of oxygen for the developing young (See figure 2 for cuttlefish eggs deposited on the ceiling of a small cave). After one month the eggs hatch and the juvenile cuttlefish drifts with the current until it finds a reef on which to live. The adult animals normally die after the mating process and their surfboard shaped cuttlebone washes ashore. Cephalopod Behaviour, Hanlon & Messenger. The Encyclopaedia of Underwater Life, Banister and Campbell. Pages 250 – 273. This entry was posted on Saturday, December 11th, 2004 at 4:12 pm	and is filed under Marine Life Articles. You can follow any responses to this entry through the RSS 2.0 feed. Both comments and pings are currently closed.